Taking on the challenge of reviewing a new Doro release makes me a bit nervous. What if I don't like it? Will I be able to visit Wacken again or can I ever go shopping south of the border again? Yes, you definitely sense the German pride in the sympathetic Doro Pesch who, it seems, has been there since the time of the dinosaurs and somehow fails to age. 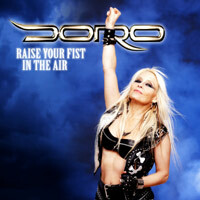 Now, Doro has been picked up by Nuclear Blast, and probably not a bad business move by NB? Add to that Volbeat producer Jacob Hansen, I reckon you have a winning formula, eh eh? Perfection expected. The first Doro goes Nuclear Blast offering is an EP, and the three songs (the fourth is just the title track in a French language version) are fairly diverse. I really don't know much about Doro's music, to be honest. Listen to very, very little Warlock back in the day (I only recall Für Immer from sometime during the 80s, the ballad some of you might also remember) and the only Doro material I picked up along the way is what I accidentally ran into at Wacken. Never really cared much for it, but for the sake of this review I'm now digging into the EP whilst putting my dusty hard rock glasses on. The title track is catchy and very easy to get into. A mid-tempo rocker with a sing-along chorus which is likely to go down a storm in the German concert halls. A one-strong-girl-against-the-world tune. Approved riffing and soloing. With Victory Doro confuses me at first. A Black Sabbath cover? Iron Man intro? No, it soon transforms into another catchy rock tune with a lovely, floating riff. Only marred by a very oddly sounding scream from Pesch towards the end. The German language ballad Engel draws on all clichés; heart-breaking, sentimental story about a guardian angel who looks over the 'you' of the story where ever fate takes him and whatever cruelties he's going to be dragged through. Doro does have the passion it takes to make a ballad like this live, but, you know, a big part of me says that it's extremely cheesy. All in all a fine experience, even for someone who's not a fan - a true fan must be loving it!